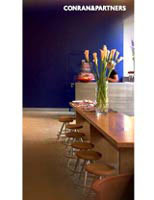 Conran & Partners has designed interiors for the first Conran restaurant to open in London since early 2000. Almeida Restaurant and Bar, in London’s Islington, opens on 3 December. Located on Almeida Street, opposite the Almeida Theatre, the French restaurant incorporates a restaurant, separate bar and private 16-seat dining room. Interiors are ‘simple, but contemporary’ and feature banquette seating and oak-topped tables with yellow undercloths. It also features Hulton Getty’s Funny Peculiar photographs and cartoons of restaurant scenes from a French 1900 satirical news-sheet called Le Rire, to reflect Almeida’s regional French cooking bias.